Weinstein understood the limits of medical technology. My father’s medical career took an abrupt turn one day in the spring of 1960 at the New England Medical Center. He was a medical resident doing an elective in hematology but decided to attend a talk on an infection, meningococcemia, given by Tufts professor Louis Weinstein, an expert in infectious diseases. Transfixed during the lecture, my father, Phillip Lerner, had the audacity to approach Weinstein afterwards and ask if he had an opening for an infectious-diseases fellow two summers later, when my father, a graduate of Case Western Reserve School of Medicine, would complete his residency in internal medicine at Boston’s Beth Israel Hospital. After some inquiries about my father’s performance, Weinstein offered him the position. For my father, my family and me, the rest, as they say, is history. Just what had made Weinstein so compelling for my father? It turns out that Weinstein was one of the founding fathers of the specialty of infectious diseases, and he had used his position at Tufts to popularize the field across the country. 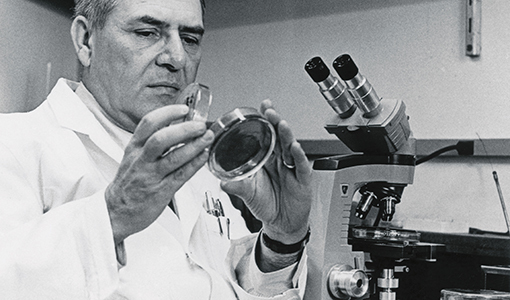 During Weinstein’s time at the school and the New England Medical Center [now Tufts Medical Center] from 1957 to 1975, he trained several dozen infectious-diseases fellows, many of whom became luminaries in the field. Even more important for me, as I wrote a book on my father’s career, was Weinstein’s legacy as a master clinician, one who could not only make spectacular diagnoses and cure “incurable” diseases, but one who also understood the limits of medical technology and the importance of keeping the patient front and center. To understand the historical impact of Weinstein’s years at Tufts, it helps to know about the history of infectious diseases. Prior to the 1930s, there were no antibiotics, and so physicians largely treated infections like tuberculosis, pneumonia and diphtheria with supportive care. Mortality rates for these diseases approached 25 to 50 percent. Most devastating of all was endocarditis, an infection of the heart valve. Patients with this condition—often young people who had earlier contracted rheumatic fever—often died a slow death as their heart failure worsened. It was nothing short of miraculous when the first agents that could cure bacterial infections, the sulfa drugs, appeared in the mid-1930s. Even better was penicillin, which was introduced during World War II and became widely available in the late 1940s. Another great success was the introduction in 1947 of the first drug that could treat tuberculosis, streptomycin. Physicians practicing medicine in this era all had stories of moribund patients seemingly rising from the dead when they were fortunate enough to receive these new drugs. Weinstein was “a bridge between the eras before and after the introduction of antibiotics,” according to one of his longtime Boston infectious-diseases colleagues, the late Morton N. Swartz, A38, former chief of infectious diseases at Massachusetts General Hospital. Weinstein trained initially at Yale University as a microbiologist, a background that gave him particular insight into the behavior of bacteria. After graduating from Boston University School of Medicine in 1943, Weinstein joined the faculty there. His mentor was the internist Chester Keefer, who had served as America’s informal “Penicillin Czar” during World War II, allocating the small amounts of the precious antibiotic. Weinstein also was the medical director of the John C. Haynes Memorial Hospital, an isolation hospital in Brighton, Mass., that quarantined patients with potentially contagious infectious diseases. At the Haynes, Weinstein saw a vast number of infectious diseases, including scarlet fever, diphtheria and whooping cough, many of which would largely disappear in the coming years. Perhaps Weinstein’s finest moments at the Haynes occurred when, after local obstetricians refused to come to an infectious-diseases hospital, he delivered babies of several women with polio who were tightly encased in iron lungs. By the late 1950s, with the diffusion of antibiotics, the rates of contagious diseases were declining, as was the census at the Haynes. It was time for Weinstein to move on. He was recruited to become the head of infectious diseases at Tufts in 1957 and would spend the next 18 years running a laboratory, treating patients and teaching fellows, house officers and medical students. As my father learned, Weinstein’s teaching rounds were, in the words of another Weinstein trainee, Tufts professor of medicine Sherwood L. Gorbach, ’62, a “supreme inspiration” and full of powerful clinical stories. Typically, a resident or fellow would present a recent case of an infectious disease, allowing Weinstein to speak for 60 to 90 minutes—without audiovisual aids or notes—on the history of the disease in question, its diagnosis and its treatment. Weinstein’s drew on his vast clinical experience to recount memorable cases of diseases such as haemophilus meningitis or gram-negative endocarditis, sharing both pearls and pitfalls. It was his sheer command of the material that so amazed those in attendance. Weinstein, my dad later wrote, was a “mesmerizing, dynamic teacher” who was “fanatic, encyclopedic, opinionated, scholarly and demanding of his specialty and all those who aspired to it or intersected its vast boundaries.” When Weinstein instituted an extra Saturday morning teaching rounds, as well as a citywide infectious-diseases conference that met on Friday afternoons at either Tufts or Massachusetts General Hospital, the lecture halls were packed. Weinstein was equally adept at the bedside. Decades later, trainees and colleagues remembered him making spectacular diagnoses on cases that had stumped other doctors. Former Weinstein fellow John Brusch, A65, M69, recalls a case in which Weinstein asked to see a child with supposed encephalitis and correctly changed the diagnosis to tuberculous meningitis when he picked up a facial nerve paralysis that the other doctors had all missed. The late Harvard virologist Bernard N. Fields saw Weinstein diagnose mononucleosis in a patient with a neck mass previously assumed to have ben cancer. Weinstein had “medical intuition,” Gorbach has written. The doctor’s commitment to his patients was legendary. He reminded his fellows that infections behaved differently in different patients. Prescribing an antibiotic was only part of patient care. Weinstein insisted that his fellows see their patients twice daily, both in the morning and in the late afternoon. After returning home for dinner, Weinstein would travel to nearby hospitals that lacked infectious diseases specialists to see hard cases—something he clearly did not need to do. His wife, Ethel, drove her husband—who never enjoyed driving—and patiently waited for him in the hospital lobbies. Although Weinstein admitted that such consults brought him prestige, he wanted to make sure that these patients were receiving appropriate care of their infections. “There’s no one else out there,” he once told Brusch. Weinstein’s fellows also carried out research, much of it focused on the growing number of antibiotics that were available by the 1960s. My father was fortunate enough to participate in one of his mentor’s most important projects, a comprehensive review of what they called “infective endocarditis” at the New England Medical Center, which wound up as a four-part article in the New England Journal of Medicine in 1966. To Weinstein’s credit, he let my father be the first author, something that he—and most other senior physicians—rarely did. Other well-known infectious-diseases specialists who trained with Weinstein at Tufts include Michel G. Bergeron, an award-winning basic sciences researcher at Laval University in Quebec City; global health expert Gerald T. Keusch, a former professor of medicine at Tufts and now associate provost and associate dean for global health at Boston University; and the late James J. Rahal, ’59, a longtime infectious diseases specialist in New York City. At times, Weinstein’s showmanship rubbed people the wrong way. Even a huge fan like Brusch admitted his old boss could be “brusque and mercurial.” Rounds with Weinstein were not occasions for friendly debate or questioning of the chief. When Weinstein believed he was right—and that was most of the time—he let others know it. Weinstein was even immortalized in 1970 in the best-selling satirical novel Heartsblood, written (under a pseudonym) by his fellow Martin Plaut, ’62. Although based on several professors that Plaut had encountered whose brilliance took a huge toll on their trainees, the book’s main character, a cardiologist, shared many characteristics with Weinstein: an ability to make brilliant diagnoses, a tendency to one-up his colleagues, a propensity for smoking and, finally, a younger colleague who drove him to and from work. “Gods do not have associates,” Plaut told me recently. Weinstein was a master clinician, one who could not only make spectacular diagnoses and cure “incurable” diseases, but one who also understood the limits of medical technology and the importance of keeping the patient front and center. hospitals; he set up a citywide medical conference; and, like Weinstein, he relentlessly warned his colleagues about the dangers of drug resistance and superinfection, both of which result from the careless prescribing of antibiotics. But mostly, he lived and breathed medicine and saw patient care as his highest calling. My father was in constant touch with the house staff when we went on vacation. Indeed, he refused to go on vacation until the end of the month, when he was certain that his house officers and fellows would be up to snuff. Ethel Weinstein once said of her husband, “His work is his hobby.” I know what she meant. I never attended Tufts, but I, too, tried to carry on in the Weinstein and Lerner traditions. True, I did not read anywhere close to 12 medical journals, which my father did in his prime. But after completing medical school and a residency in internal medicine at Columbia, I went back to school and earned advanced degrees in the history of medicine and bioethics, two fields that also try to put the patient front and center by promoting concepts such as autonomy, informed consent and improved communication. I did have the opportunity of seeing Louis Weinstein one more time. When I was applying to medical school, I visited Harvard, where Weinstein, then 73, had moved after leaving Tufts. At my father’s urging, I made an appointment to see him before joining the activities for prospective students. We had an amicable chat about my career. I promised to send my father his regards and then headed over to the admissions office for a tour and interview. I’m not sure why, but I decided to mention to my tour guide that I had visited Weinstein. To my disappointment and surprise, he rolled his eyes. “He just goes on and on about those old diseases like tuberculosis,” the student sighed. In later years, I did take some pleasure in realizing that as we spoke, the tuberculosis bacterium was quietly planning a major resurgence, which took place in the 1990s. Weinstein died in 2000 at the age of 92 after a series of small strokes. Renowned physicians often get called to see famous patients, and Weinstein was no exception. In 1973, he flew to Paris to consult on the Greek shipping magnate Aristotle Onassis. Numerous specialists had been unable to diagnose Onassis’ illness. Weinstein ultimately helped diagnose a form of pneumonia, from which the patient fully recovered. Barron H. Lerner is a professor of medicine and population health at the New York University School of Medicine. This piece draws on his new book The Good Doctor: A Father, a Son and the Evolution of Medical Ethics, published this spring by Beacon Press.